Leica SP2 Confocal - The UV AOTF cooling fan bearing is failing. Please power this unit up as needed and down when finished. A new fan is being ordered. On initialization the LCS software tends to report that the SCSI system can not be initialized. You must then shut down the software, wait for the black DOS box to close by it self then restart the LCS software. This may need to be repeated 1-4 times especially if the system has just been powered up. During LCS initialization (while the drosophila embryo image is rotating) the process will stop at initializing at "Fluorescence Module". To continue move the mouse or press shift to proceed. Otherwise you'll end up slumping over the keyboard out of boredom. New/modified/added files at the D:\Users directory are automatically copied to the main file server \\Minsky\laplace\users1 every evening at about 2 AM. USB ports are available on the computer and may be used to transfer data. Windows XP does not support USB 3, so transfers will be at USB 2.0 speeds. Please, please, please do not use a USB drive if you are not absolutely sure that it is free of viruses, trojans and malware. Be very careful, deliberate and mindful around the computer and the objectives. 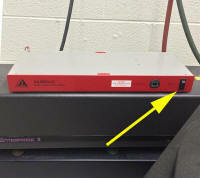 Image files will need to be transferred to \\minsky.med.unc.edu for network access from your lab/office. 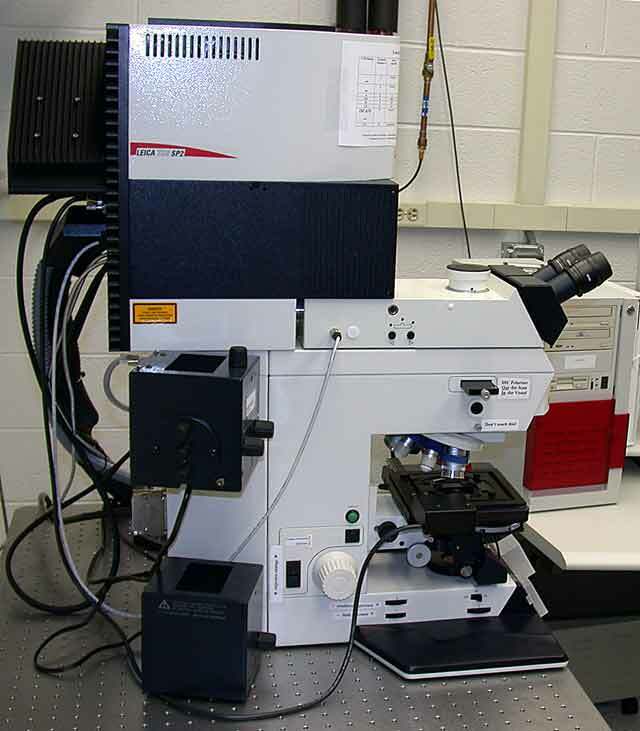 There are multiple CPUs in the scan head, microscope stand and main PC, which can individually crash causing the system to lockup in various ways. The quickest route to recovery is to determined which subsystem has locked up. LCS software can not initialize the hardware - window with yellow diagonal line appears on computer screen: Check that objective turret rotation is in a click position, shut down LCS softwarSe and restart it. If the above fails - shutdown LCS software, turn off scan electronics ("scanner" ), turn off microscope stand (controller ), if any error involves the SCSI system, shut down Windows and power off the PC computer, but leave lasers running. Restart the system following the standard start up procedures. Please make a brief note of what happened in the log book for each crash! This helps us keep appraised of the system's health. More words on dealing with crashes and lock ups. 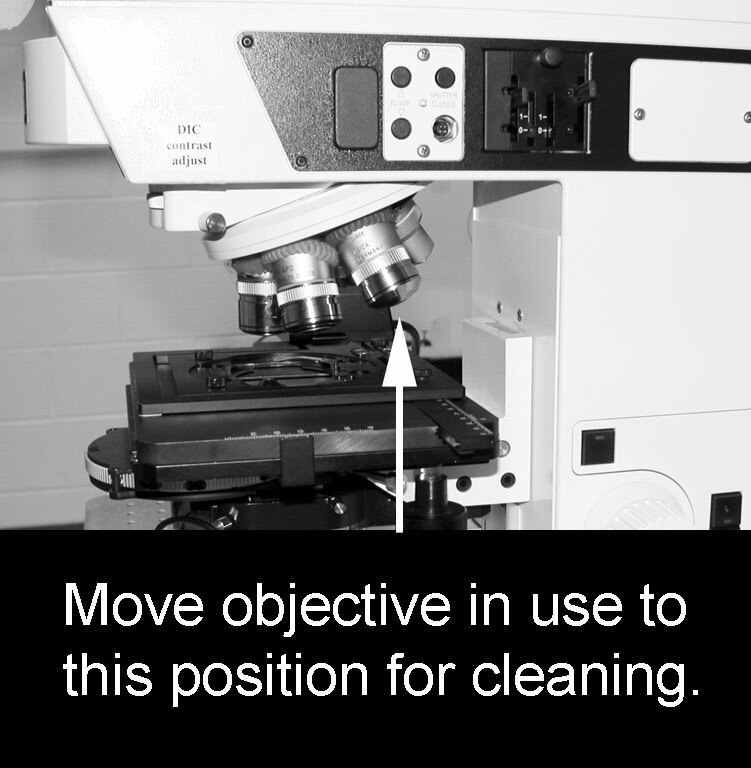 Gently clean objective with lens tissue. Blot on the glass front element. Rub slowly on the metal around the glass element. Please sign the log book in the room and note any problems. Due termination of the service contract Leica support is no longer available at 1-866-830-0735. Upper Wollaston prism (objective Wollaston) will exacerbate reflections during scanning especially with dry (non immersion) objectives. Switch objective prism wheel to bright field position BF when not doing DIC/Nomarski. Transmitted light scanning through the condenser can only be done with visible laser illumination. It can not be performed with the UV excitation laser alone. 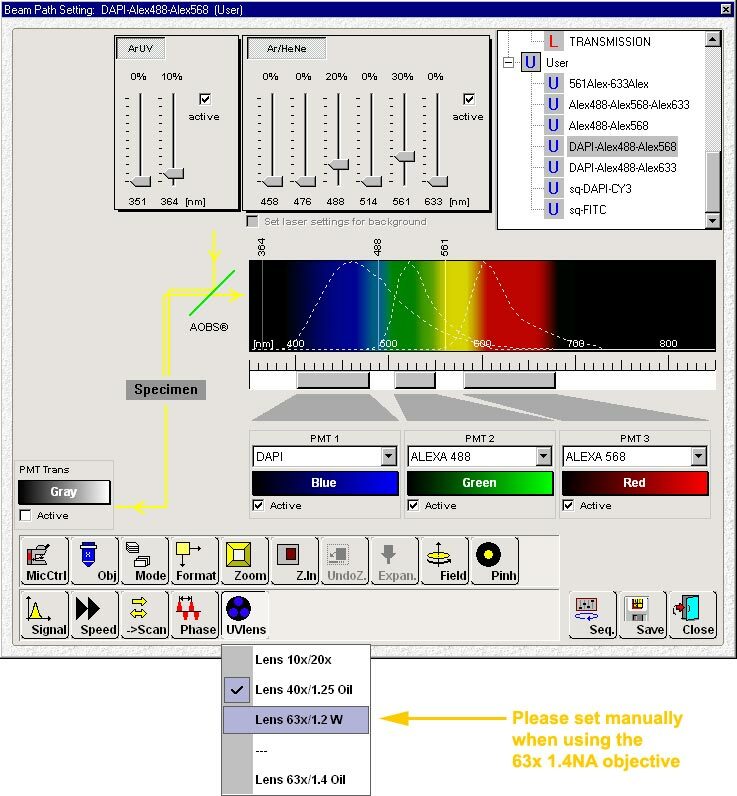 Turn on a visible laser even if the wavelength is not required for fluorescence. For DAPI scanning please make sure the UV correction lens is set to the 63X. Note that it will set automatically for the 40X 1.25 NA and 10x/20x objectives, but needs manual intervention when the 63x 1.4 NA objective is selected. This is a work around. ** dipping lenses use no cover slip. All other lenses prefer a number 1.5 (170 um) glass cover slip. 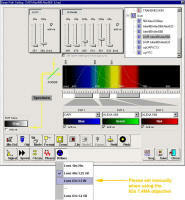 Parameter window zoom factor and several other factors does not update when loading an old image. To see these parameters, just right click on the image name in the experiment window to get a table of scan information. This information can also be gleaned from the .txt file in the image database directory. It is available from Users' Web pages (http://malus.med.unc.edu/). Note: Read/Write permission may be required required to open a Leica Image Database: Image data base files must be in a location with read & write permissions. Since CD/DVDs are read only, copy the whole database to the hard drive, and open it from the hard drive if necessary. Depending on the operating system permissions may need resetting on the hard drive after copying from CD/DVDs. German keyboard mappings translates some keyboard keys to other characters. Basically some keys have a different meaning to the label embossed into the key cap. Characters to avoid include: ! @ # ' there are others. These characters may be found in other unusual positions on the keyboard.